Pet Shop Boys on their two-hour takeover of Radio 2 playing their favourite electronic music of the last decade have just revealed that the iconic sunnies, pictured above, are lost. Gone forever. 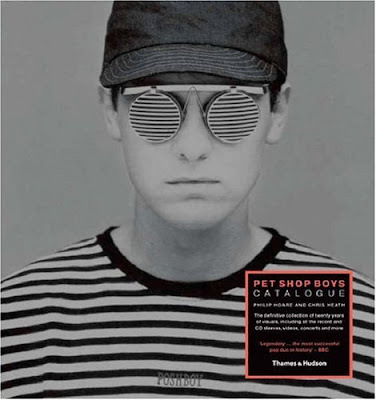 A question from a listener asking Chris about how many hats and sunglasses he owned prompted Neil to pipe up: "Where are those stripy ones that were pictured for Suburbia?" Chris shrugged a response that he didn't know, that he'd lost them. But also revealed is that after writing She's Madonna with Robbie, he'd emailed Madge asking if she was OK with it, and it turns out, she was - after all, it does make her look good. Apparently, Robbie's doing his new album with Trevor Horn. Now THAT was a surprise. And a pleasant one at that. When asked about the This Used to Be the Future collaboration with Phil Oakey, Chris said they had "a laugh" with The Human League singer. They had written the song and the vocal lines were "so Phil Oakey" that they "got him in" and the results were just as they'd imagined. Pedro, the questioner, also asked if they fancied doing a Phil Oakey EP to which Chris replied "Now that is a GREAT idea". One great question had been about PSB songs which were effortless to write. Opportunities took an astonishing 15 minutes, It's a Sin, half a day, and the new single Did You See Me Coming, just a day. ***UPDATE*** See the complete tracklisting here, and if you're in the UK, listen to the whole show on iPlayer. Thanks for the report. I noticed Imogen Heap thanking them on Twitter for playing Headlock and mentioning her new CD by name. Good taste, those boys.